The Crystal Maze was a big deal during the early nineties. If you were like me and in your early teens, it was required watching and, frankly, terribly exciting and cutting edge. It represents the pinnacle the adventure-style game shows that replaced boring old quiz shows for a while and filled the gap before they invented reality telly. The concept was simple. Richard O’Brian would jauntily guide a group of hopeless corporate bores in jumpsuits through a series of zones (these varied over time but I keenly recall the Industrial, Aztec, Marine, Fururistic and Medieval zones) playing a series of games in the hope of garnering a crystal. The games varied and could require mental aptitude, special skills, physical ability or lateral thinking. The games were strictly timed and if you didn’t get out in time, you were locked in your cell. Freedom would cost your team a crystal. Each crystal (which were quite cool Swarovski style many sided paperweights) bought the team 5 seconds of time in the Crystal Dome where the contestants would attempt to grab metal tokens blowing around them. If the team collected more gold than silver tokens, they would win a series of middle manager style treats. Hot air balloon trips, rally circuits of Brands Hatch and water skiing were popular, I recall. What may seem bewildering to people who look at the Crystal Maze videos on YouTube, is how contrived and cheap it looks now. But back then it really was quite glam. Richard O’Brian still comes across as charismatic and funny. Of course, the show was later presented by Ed Tudor-Pole who was alright but not quite and genuinely zany as O’Brian. 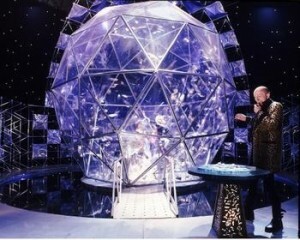 But at heart, the appeal of The Crystal Maze was in ridiculing the contestants. O’Brian led the way with withering criticism if they failed an easy task and usually offered only muted praise if they succeeded. Most of all, how we chuckled when someone who was likely called Samantha who might well have been an operations manager from somewhere like Bedford couldn’t work out the simplest puzzle and persisted in shouting “Where’s the crystal?” or “ what do I have to do?” From the comfort of our homes we worked it out instantly. Obviously. It’s difficult to see how something like The Crystal Maze could be resurrected but its spirit lives on with the sadistic tasks of I’m a Celebrity, Get me Out of Here! And the notion of contestants as playthings has been taken to greater extremes in Big Brother. Annoyingly, Crystal Maze clips on YouTube are general banned from being embedded. But this spoof from The Mary Whitehouse Experience featuring Punt and Dennis does rather sum it it all up rather well.